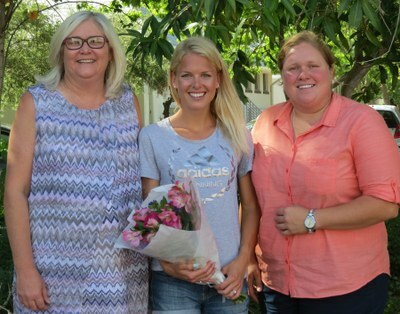 South African Olympic athlete and Rhenish Old Girl (class of 2010), Dominique Scott, visited Rhenish Girls' High for the opening Assembly on 11 January 2017. Dom shared a message with the girls of identifying their dreams - and not being afraid of dreaming big - and then working steadfastly towards achieving that dream. Dom's dream of being an Olympic athlete and earning a scholarship to a US university was born at the age of 12.​ Her success, she said, was not immediate or easy. To achieve one's dreams, Dom believes, one must realise that there are no short cuts or instant success. There is only hard work.